Justin Wright, M.D., is all too familiar with diabetes, high blood pressure, and obesity as a borderland physician. More than a quarter of El Pasoans are obese or have hypertension, and some 12 percent have been diagnosed with diabetes. But don’t hit the gym just yet. 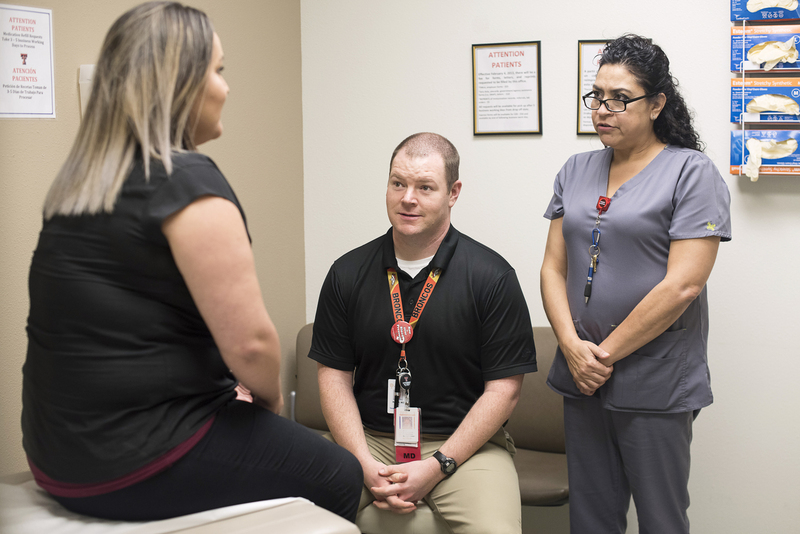 Justin Wright, M.D., a primary care and sports medicine physician at Texas Tech Physicians of El Paso, helps patients get healthy through simple lifestyle changes, like diet, exercise and ample sleep. Carbohydrates are calorie-dense foods that are often unhealthy and processed, such as white rice, bread and pasta, and sweetened beverages and desserts. Besides adding to your waistline, carbs are especially worrisome for diabetics. Although not all carbs taste sweet, they break down into sugar when ingested, causing a spike in blood sugar. There are good carbs, though, like fruits, legumes, and veggies. These natural carbs are fiber-rich and low on the glycemic index, meaning they don’t cause such a rise in blood sugar. Michael Steele’s diabetes has gone into remission since he followed Dr. Wright’s advice to kick the carbs. Since starting the Atkins diet a year-and-a-half ago, Steele has lost four inches from his waistline and is no longer considered overweight. His blood pressure is the lowest it’s ever been and he isn’t on any medications, either. Steele has more self-control than most, though. “I pretty much live on protein,” he explains. That means quitting bread and potatoes, including hashbrowns and potato chips — some of his favorite snacks. For dessert, Steele usually munches on frozen cherries, and on rare occasions, he will treat himself to low-carb ice cream. Dr. Wright, who works at the TTP El Paso Hague and Kenworthy clinics, couldn’t be prouder of Steele’s progress and commitment to his health. While a healthy diet may be the doctor’s number one recommendation, he says not to forget exercise and sleep. People should aim for 150 minutes of moderate activity a week — and walking counts. Seven to eight hours of sleep a night will also help you maintain a strong immune system to fight off illness.